The Great Haircut Project | Start The Evolution Without Me! Well, welcome back, me! I finally got my new computer and now I’m ready to do some posting! At least I hope I am. The new computer works great, but I’m still in the process of trying to figure out how to get photos stored on one computer into my picture-sharing site and then access it from this new computer. I figure a good night’s sleep will make it all clear for me very soon. But in the meantime, I will work with what I’ve got! A few weeks ago, I decided it was time to get my hair cut. It was getting out of control. 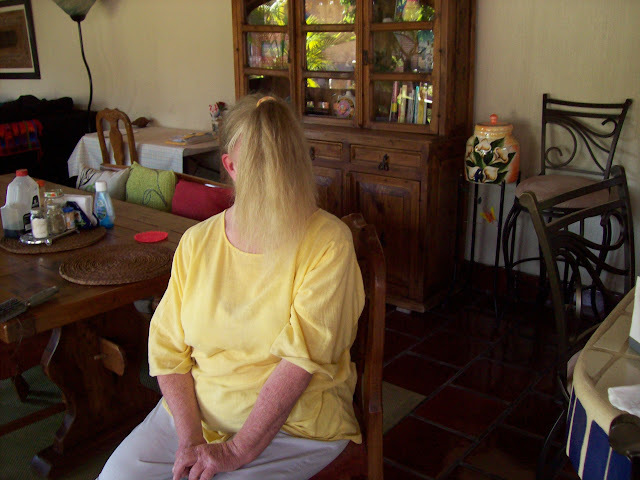 For years I have been advised that old ladies should not have long hair and I have, for the most part, ignored that advice. I figure that a couple of the privileges I’ve earned by virtue of living 65 years is that to say and wear pretty much anything I want, and look pretty much any damn way I choose. And I take full advantage of that. I’ve been waiting all my life to be a crusty, shocking old broad and my time has finally arrived. Not just long, but scraggly with loads of split ends. 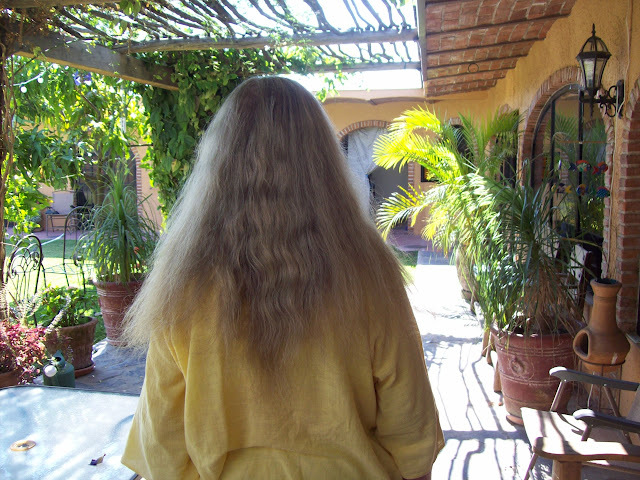 The hair of the Mexican bruja [witch]. Since my friend Ric was due to arrive in a couple of weeks, I decided it was time to at least cut off the split ends. I mean, you can’t greet the high school homecoming king with split ends; right? 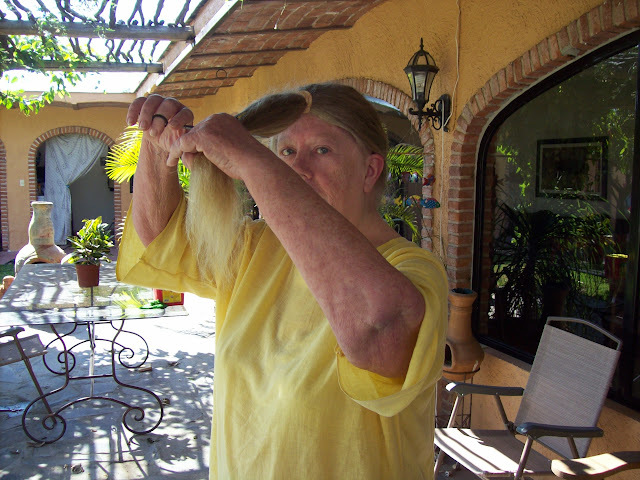 Haircuts are, for the most part, cheap in the Lake Chapala area of Mexico. 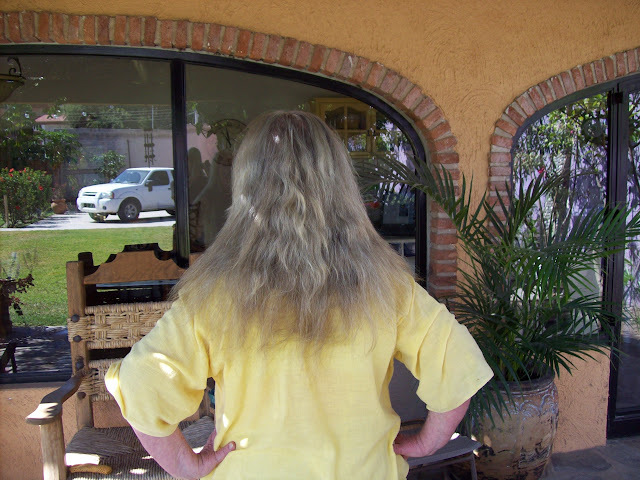 Oh, sure, there are those “salons” that cater to gringas that can run you 200 pesos or more, but here in Joco I could have gotten a nice trim for probably 50 pesos. Right around the time of these pictures, a new place had opened up on the carretera [highway] in Joco advertising cuts for 25 pesos. 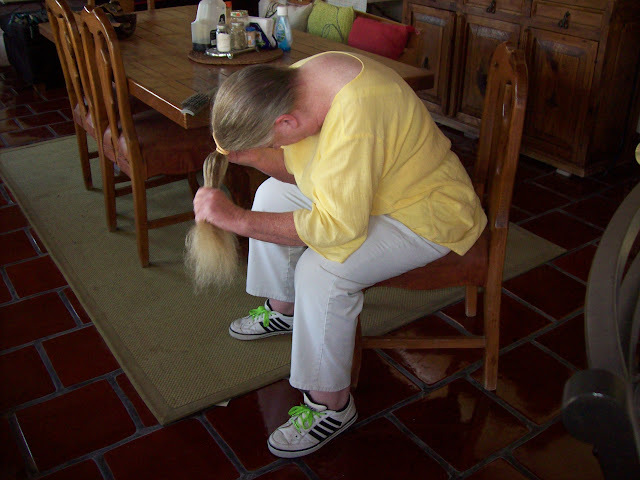 But I figured that if I walked in with my mop of hair and asked for the 25-peso cut, the girl would pass out. So I decided that I would visit another of our local haircutters and get it taken care of. Readers, by now you must know that I am a bit, shall we say, thrifty. “Things” are not really important to me, nor is money, except for the ability to live on a minimal amount. I mean, the lack of funds is what induced me to move to Jocotepec, Jalisco, Mexico, in the first place. Here I can live well on my limited funds. In the US, I probably couldn’t live at all. I’d be starving to death or homeless or both. But that is neither here nor there as regards this post. 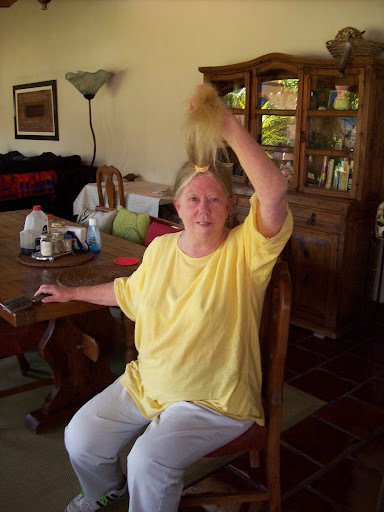 This post is about the great haircut project of 2012. And you are about to see a step-by-step photo album of how it went down. Are you ready? This may seem simple to most of you, but when you are as fat as I am, with high blood pressure, this may be a life-threatening event. Hence my decision to employ my friend Jonnie as photographer and nurse-on-duty. She could not only snap great pictures, but could possibly resuscitate me if I passed out. What a great friend to have! And then I panicked! No, really, I did. I forgot all the instructions for the next step! What to do? What to do? So I did what any computer-semi-literate in 2012 would do, I ran to the computer to find the original article and read up again on the next step. And, no, you are NOT going to see pictures of that! I know that every woman reading this is doubting it, but I really do have SOME pride! Instructions in mind, I continued bravely on. Point the scissors straight up, it said, into your ponytail, and start snipping away until it looks like your father’s shaving brush. Now, I suppose that’s a decent instruction, but my father never used a shaving brush to my knowledge. He was strictly a go-to-the-barber guy until he became an electric razor guy. And then it was time for the great reveal! Are you ready? No, really, are you ready? Because here it comes! But personally I am thrilled that for one of the few times in my life I actually did something by myself instead of paying for it. And, oh, yeah, I know it shows! But I would not have missed it! 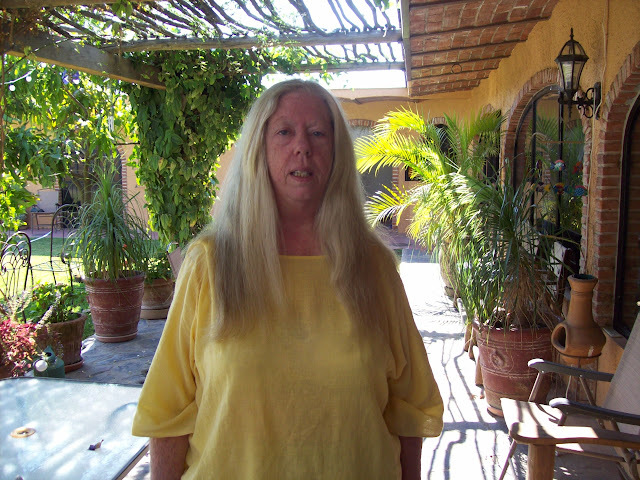 This entry was posted in Fun Stuff, General, Getting Older, Lake Chapala and tagged Daily Mail, Hair, Hairstyle, Jalisco, Jocotepec, Long hair, Mexico. Bookmark the permalink. looks good to me. I wonder why the shaving brush technique as opposed to a straight (blunt) cut? 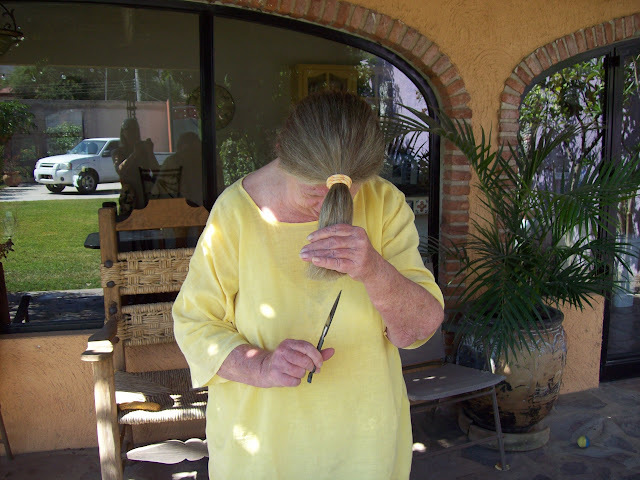 on my hair, blunt cuts look ‘healthier’ – but then my hair is pretty thin & it looks thicker that way. Gaby, supposedly the shaving brush technique was to make the layers blend into one another. ooooh, tinsel. barb like. maybe i could use shoestrings from the joco tianguis [see shoelaces and fat ankles in third picture above]. thanks!! glad it sometimes gives you a laugh. 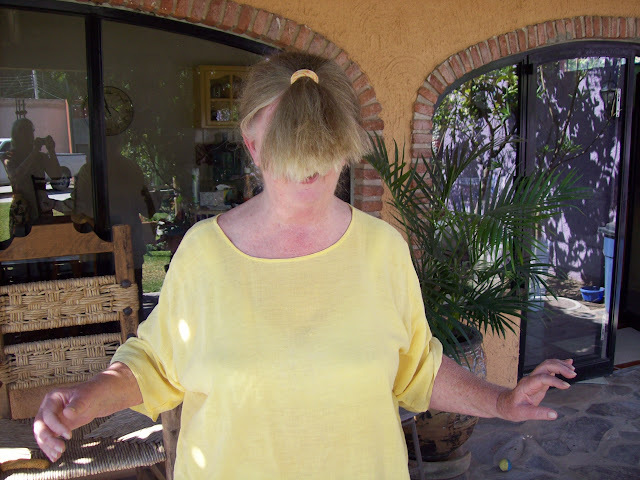 i didn’t think that the haircut project was so funny, but, boy, my friend jonnie who was taking the pictures did! And btw, in 1970 I saw the original cast do HAIR! the musical at the Aquarius Theater in L.A. $12 a ticket!! It was the most expensive date I’d ever had. When you’re making $100 a week $24 is a lot of money. well, i didn’t cut it that much, mike! in fact, i think everything i cut off has almost already grown back. i saw the original cast do Hair in san francisco in late 1970. i don’t know how much the tickets were….my son’s father and i got tickets for our birthdays [four days apart] from the other commune members. i remember it well! Took me time to read all the comments, but I really enjoyed the article. It proved to be very useful to me and I am sure to all the commenters here! It’s always nice when gossip about celebrities you can not only be informed, but also entertained! I’m sure you had fun writing this article…. I want to hear the floppy horned unicorn jokes!! Loved the pictures!! You look GREAT!! Miss Me! Barb! I’m working up the nerve to try your hair trick, ‘cuz mine is way too long. As is the time since I’ve read any blogs, so am catching up on what I missed! 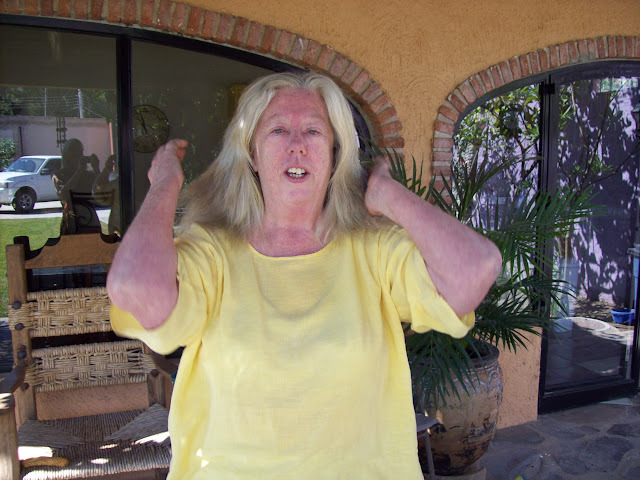 We headed out from Tucson on a sunbird trip (opposite from snowbird) in June and I’ve been out of it since, as we’ve been visiting, visiting visiting folks. Now on the downhill run back (will be there in 2 days) I’ve begun to catch up! Good to be sort of ‘in touch’ with you again!